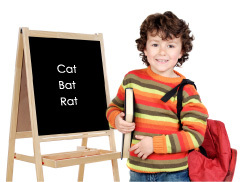 Our phonics lesson plans for kindergarten, 1st, 2nd, and 3rd grades are based on the belief that all students learn best when they are actively involved in the learning process. Through music and rhythm, Sing Your Way Through Phonics engages young readers physically, mentally, and emotionally so that the phonics concepts are easily grasped and retained. Linking learning to music has proven especially effective with ESL students, students with dyslexia and learning disabilities, and those with special needs who do not respond well to traditional pencil/paper exercises. Each of the classroom-tested lesson plans listed below correlates with one of the phonics teaching songs from each volume of Sing Your Way Through Phonics. Our Ready-to-Read! volume includes phonemic awareness lesson plans for pre-K and kindergarten. Volume 1 covers letter identification to early words for pre-school through 1st grade; Volume 2 covers long vowel spellings to -s and -es endings for 1st and 2nd grades,; Volume 3 covers w-h words to -tion suffixes for 2nd, 3rd, and 4th grades. These phonics songs and concepts can also be previewed earlier or reviewed later than the intended grade levels. Each phonics lesson plan includes song lyrics and tunes, objectives, an explanation of the concept, a basic procedure for introducing the concept, follow-up activities to enhance retention and understanding, and extensions such as games, manipulatives, and literature connections. You can use our Scope and Sequence or Parent Guide to help determine which phonics lesson plans are best matched to your student’s needs. * Volume R indicates readiness volume entitled, Ready to Read!